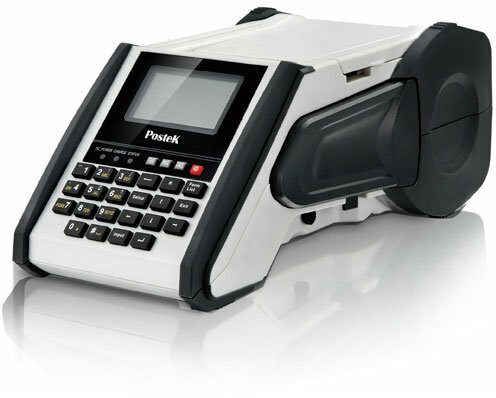 The Postek V6 brings flexibility and user convenience; an affordable choice for a variety of mobile workforce applications without compromising features. The versatile V6 offers the long-lasting image durability thermal transfer printing delivers, plus direct thermal printing capability to complete the job fast no matter the application requirements. Choose to download label forms in advance or simply input information on-the-spot, so no asset is missed. With a memory capacity of 8MD Flash ROM, you can store hundreds of forms and when needed, easily locate any form using the built in index feature. Comfortable transport over the shoulder or via a hand holding strap enables you to reach the 9-key keyboard and view the LCD screen and 3 indicator lamps for intuitive operations. Boasting predictive text input, the V6 promotes faster input from users while enhancing input accuracy. Also, fitted with a Real Time Clock, this printer easily denotes dates or expiration dates seamlessly. Enabled by the robust 7.4 volt 2200mAh li-on battery, the V6 printer produces long-lasting bar codes, text and graphics all day long. Or, if in the office, connect to a computer with USB interface and power adapter. This convenient small-footprint printer is not only compatible with most media brands; operations are simple for accomplishing immediate labeling tasks. And, for added value, Postek packages every printer with robust label software to create labels right out of the box. Media Width: 2.17″ (55 mm) max, 0.4″ (10 mm) min. Supply roll: OD 3″ (76.2 mm) max., ID 1″ (25.4 mm) min. Ribbon Ribbon roll: OD 1″ (25.4 mm) max., ID 0.5″ (12.7 mm) min. Postek V6, a portable thermal transfer printer, is designed for onsite printing of long-lasting labels which can withstand hash environmental conditions. V6 is used in telecom for cable marking and many other industries utilizing field service, such as construction, food labeling, warehouse and distribution, and greenhouse/nursery.